Locations of known SCP-3023 incidents are highlighted in red. Special Containment Procedures: Phone calls and internet traffic in SCP-3023's active region are to be monitored closely for mention of events correlated to SCP-3023 activity. Should SCP-3023 activity be confirmed, Mobile Task Force Alpha-21, "Julia's Angels", must immediately be dispatched to the location. MTF Alpha-21 is tasked with locating the active SCP-3023-A instance, determining the appropriate method of decommissioning the object, and performing the decommissioning. As the safest method of eliminating an instance of SCP-3023-A is typically via explosive device, appropriate cover stories should be prepared in advance for any damage and fatalities incurred this way. MTF Alpha-21 liaises with the German Air Force to provide support in the event that conventional tactics prove insufficient. SCP-3023-B is kept in a reinforced humanoid containment unit at Site-06-2. It must be monitored at all times for signs of anomalous activity. All surveillance footage in SCP-3023's active range must be monitored for activity matching SCP-3023-B's observed anomalous properties. Description: SCP-3023 is a phenomenon in which an object will abruptly develop an arachnoid form and gain motility in the presence of humans. 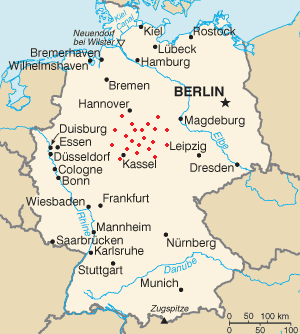 SCP-3023 has thus far occurred exclusively in a well-defined region of central Germany (see map). This occurs on an irregular basis, with an average of two months between occurrences. Objects affected by SCP-3023 are collectively designated SCP-3023-A. SCP-3023-A will behave erratically, generally moving around their vicinity at random and using their legs and pincers to attack anything they come in contact with. SCP-3023-A display speed, durability, and physical strength far in excess of what their structure and composition should allow. Destruction or dismemberment of the object is sufficient to cause anomalous properties to cease. The mechanism by which SCP-3023 occurs is unclear. What follows is an abridged list of SCP-3023-1 instances. A1 A baseball, ripped apart to produce eight pointed legs surrounding a central mass. SCP-3023-A1 reportedly animated mid-pitch; upon impact with the catcher's mitt, SCP-3023-A1 attacked the catcher lethally, then remained on the field for the following 84 minutes before its destruction by civilians. First recorded instance of SCP-3023-A. Initially classified as an extranormal event. A4 A metal folding chair. The legs and other tubular segments functioned as legs, with the seat and back operating as a central mass. Animated in an abandoned office building in the presence of several urban explorers. Several seconds of footage, during which SCP-3023-A killed two explorers, were recorded. First instance of SCP-3023-A behavior caught on camera. A6 A telephone. Exact configuration unknown. No living witnesses could provide a detailed description of the item. MTF Alpha-21 destroyed SCP-3023-A6 remotely via explosive after four hours and two Foundation casualties. See Addendum 3023-A. A13 A gelatin capsule containing ibuprofen. The object appears to have simply developed an arachnoid shape while maintaining structural integrity. Damage to SCP-3023-A13's sole casualty suggests that it became animate inside the victim's throat and exited through the spinal cord, resulting in death. As the subject was alone at the time, SCP-3023-A13 was only discovered four hours later. Smallest recorded instance of SCP-3023-A; longest time between animation and destruction. A15 A Mercedes-Benz GLS550 SUV. The front and rear of the vehicle formed into a distinct cephalothorax and abdomen, respectively, while limbs were formed from deformed auto parts. SCP-3023-15 became animate while traveling at 72kph; it was shown capable of maintaining this speed post-transformation. The vehicle's occupants are believed to have died during this transformation. Between SCP-3023-A15's actions and resultant automobile accidents, forty-one casualties were reported. Largest instance of SCP-3023-A thus far; closest SCP-3023-A has manifested to a Foundation facility (250m). SCP-3023-A15 was destroyed via air strike when it became apparent that MTF Alpha-21 lacked the ability to properly contain it. A19 A human corpse. The skeletal system was radically reorganized, allowing four additional 'limbs' made of bone to emerge from the abdomen. SCP-3023-A19 animated during an initial examination by the local police department after it was found on the side of a road, resulting in six casualties. A civilian was able to temporarily disable SCP-3023-A19 by running it over with an ambulance. First instance of SCP-3023 directly affecting an organism, living or otherwise. The corpse in question had not been identified prior to animation; no match for the recovered genetic material was found. No cause of death was readily apparent. Addendum 3023-A: Security footage from the day prior to SCP-3023-A6's activation showed an individual breaking a window to enter the premises of the office in which SCP-3023-A6 was located. When he had acquired the telephone in question, his jaw distended and then split open horizontally; four dark, tongue-like appendages extended from his mouth and rubbed the telephone for 36 seconds before retreating. After closing his mouth, the individual returned the telephone to its proper location and exited the premises. Forensic evidence has conclusively identified ████ Sauer, a local restaurateur, as the individual shown in the footage; however, thorough examination of Mr. Sauer's body has failed to identify any anatomical abnormalities that could account for the events shown in the security footage. Mr. Sauer has denied any memory of the event, familiarity with SCP-3023, or knowledge of his observed properties. There is no evidence that Mr. Sauer had been in contact with any other instance of SCP-3023-A, and he has displayed no anomalous properties since his detainment. Mr. Sauer has tentatively been classified as SCP-3023-B.